If there's one thing you don't want to compromise on, it's the safety and durability of your large tent. The Premier Party Canopy Tent for 50' Midsections makes event hosting, temporary storage, outdoor revivals, and even tent rentals a breeze. It's the perfect expansion for your sectional Premier Party Canopy Tent. The top is available in solid white 15 oz. vinyl and 15 oz. white vinyl with 14 oz. translucent color stripes. A 1 year manufacturer's warranty is included with this item. 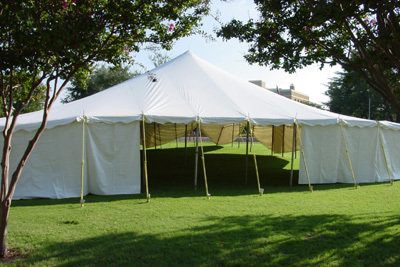 If the tent is 50' long, what is the width? Thank you. This tent is a 50' x50'. How many people will this tent hold? This is a total of 2500 sq ft, and it will hold 300 people standing. If you are using tables, stages, and chairs it all depends on how you arrange the area. Is this canopy a true 50 x 50? This canopy does indeed measure 50' x 50' in overall area.